Asheville’s reputation as an arts destination is well known, but there are still under-the-radar parts of the art scene to explore. While many associate Western North Carolina with the pottery tradition, the region was more recently pivotal in the development of another field: studio glass. 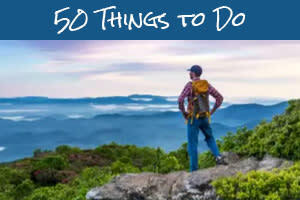 If you’re not familiar it, the Asheville area is a great place to start discovering this extraordinary art form. While immersing yourself in Asheville’s celebrated arts scene, checking out local studio glass artists is a must. There are a few reasons Western North Carolina’s studio glass community is considered world-class. Bringing glass beyond the functional into the decorative and sculptural arts began in the nineteenth century, but took a great leap forward in the 1960s. 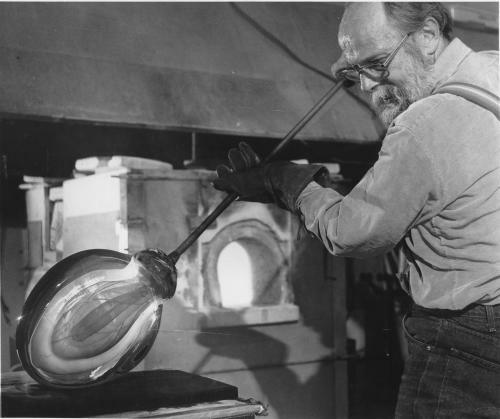 Along with several colleagues, Harvey Littleton—known as the “father of the studio glass movement” (pictured at right)—began to innovate with blown glass, and in 1965, his student Bill Boysen built a groundbreaking studio glass furnace at Penland School of Craft. Littleton moved to the area in 1976 and some of his students, including world-renowned artist Dale Chihuly, have studied and taught at Penland through the years. The range and quality of work being produced here is impressive. Whether you’re interested in blown glass or stained glass, sculptural or functional, cutting edge or traditional, you’ll find artists creating it in WNC. If you’re looking to add a piece to a serious studio glass collection, you can peruse down galleries such Bender Gallery, focused on sculptural glass, Momentum or Ariel Gallery, offering works in a variety of media. Or pick up a beautiful functional piece at the Folk Art Center. Learn more about the different types of glass art in WNC. Many Asheville area glass artists have an open door policy. 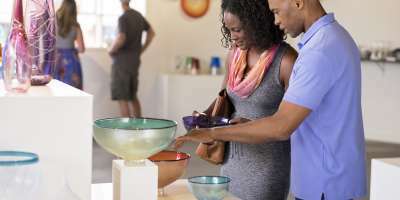 Along with a gallery, at the North Carolina Glass Center in the River Arts District, you can find daily educational offerings ranging from demonstrations to workshops. Try a 30-minute Make Your Own Class session at the Center’s Flame Shop or a more intensive Introduction to Flameworking. 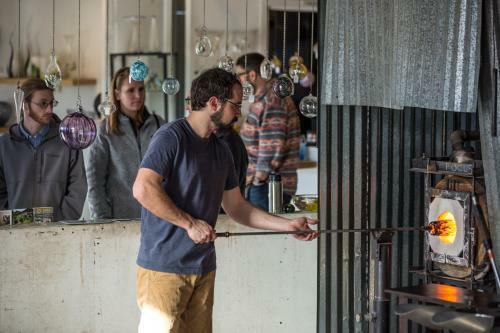 At downtown’s Lexington Glassworks, you can watch glassblowing while enjoying a local beer, served right in the shop. With the area’s long-standing glass tradition, there are now second-generation studio glass artists in the area, such as internationally known innovator Alex Bernstein and up-and-comer Hayden Wilson. 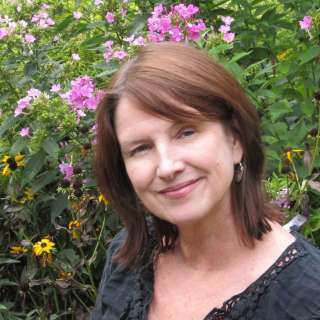 But the spirit of experimentation and innovation here means that new artists are entering the scene all the time. Penland School of Craft was at the forefront of studio glass from the beginning: the first National Glass Conference (later known as the Glass Art Society) was organized at Penland in 1971. The area around Penland is still home to an impressive number of glass artists, including Garden & Gun magazine’s Made in the South 2016 winner Terrane Glass, Bueno Glass, and Fyreglass Studio. 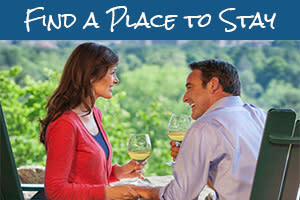 Take a glass day trip to visit Penland’s gallery or the Toe River Arts Council’s gallery to discover a range of work. While there’s always something new to discover in the Asheville studio glass scene, 2018 is an exciting time for glass in Western North Carolina. 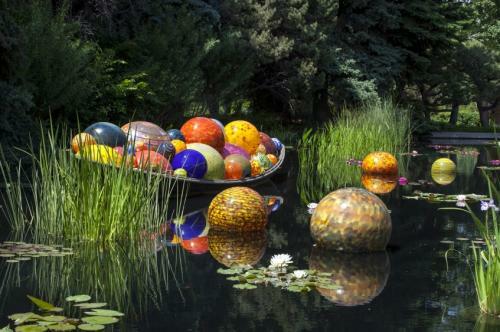 From May to October, visit Chihuly at Biltmore, a first-in-North Carolina garden exhibition of the artist’s work in Biltmore’s historic gardens. Shining the spotlight on local glass artists, a group of over 60 institutions and artists will participate in the Summer of Glass, series of special events including the history exhibit entitled North Carolina and the Studio Glass Movement the first weekend in June at 14 Riverside Drive, across from Curve Studios in Asheville&apos;s River Arts District. Through Art Connections, you can take a VIP weekend tour each month June through September, including studio tours, hands-on opportunities, tickets to see Chihuly at Biltmore, collector home visits and more. While planning your Asheville arts itinerary, make sure to add some spark, fire and flame to it with an exploration of Asheville studio glass artists. Top photo by Steven McBride; historic photo courtesy of John Littleton; glassblowing demo photo by Jared Kay; Chihuly photo copyright ©Chihuly Studio, courtesy of The Biltmore Company.